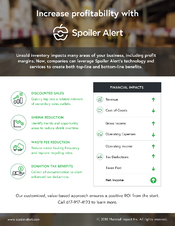 How does improving unsold inventory management impact the bottom line? Want to know more? Schedule a 15-minute chat with a Spoiler Alert specialist today. Yes, send me the document!